Click here for the latest Special Use Airspace (SUA) files including the ORD class B expansion as of 21 Oct 2010. These files are for use in glider/soaring moving map and competition software such as Glider Navigator, StePla, WinPilot, SeeYou, ClearNav, etc. As presented at the 19 March 2011 Sky Soaring Spring Safety Meeting, here are two files for member use. Diagram of the key ground reference points for Sky Soaring pilots. Suitable for lamination and in-flight use. 21 Oct 2010 - Implementation!! The new ORD Class B airspace is now officially in effect as of today. Sad news for the Chicagoland aviation community. The good news is that the same aviation community was able to reduce the original scope of the expansion down to a significantly smaller enlargement. 14 Sep 2010 - IT IS OFFICIAL!! The FAA has released this document which sets the deadline for the Class B change that we all feared would happen, will officially go into effect on Oct 21, 2010. The Ad Hoc Airspace User's Group (this includes the soaring community) made many suggestions to the FAA after the initial proposal on how to make the new airspace work better for all constituents. 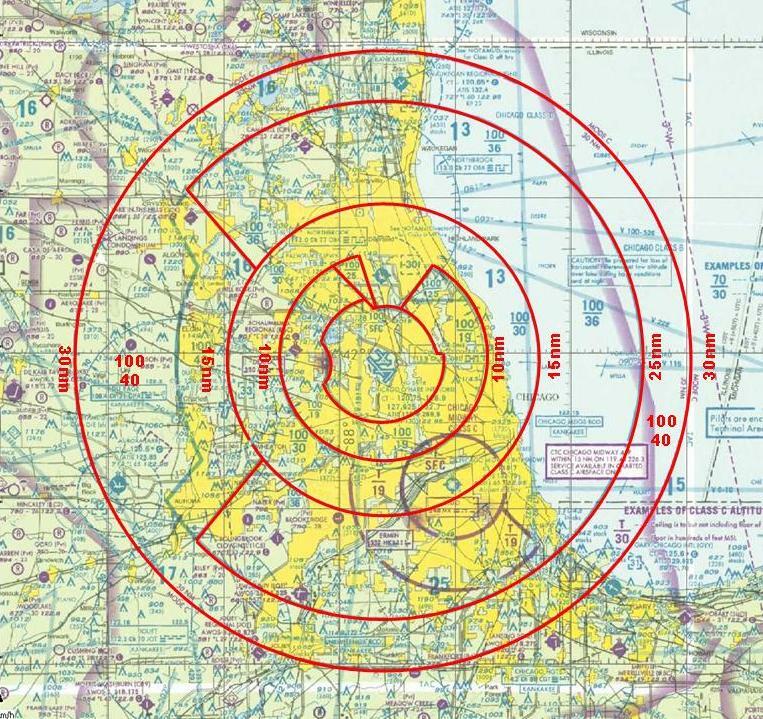 The FAA made a few concessions to the Airspace User's Group by redrawing some of the boundaries. We are waiting for the Notice of Proposed Rulemaking (NPRM) to be issued by the FAA to see where we stand and if the changes will be included in the final redraw. The NPRM is expected to be issued before the end of the year. There will be a comment period open after the NPRM is issued. More updates will be provided at that time via this web site and via http://groups.google.com/group/rec.aviation.soaring/topics. The local Chicago soaring community needs your help. 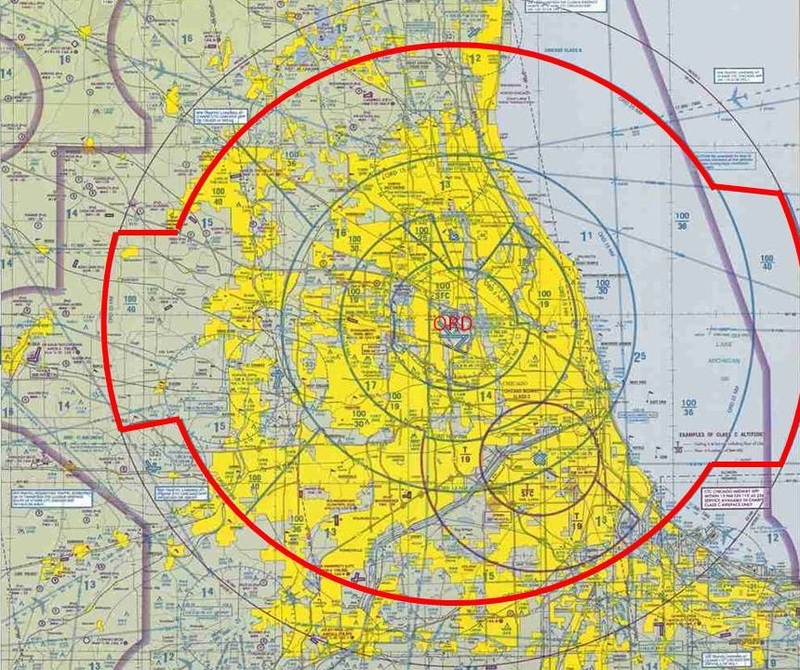 The FAA is well on their way to the expansion of the ORD Class B Airspace that will have a direct impact on soaring here in the Chicagoland area. The most problematic expansion is along the western edge out to the 30NM ring with a floor of 4,000 feet msl (~3,000 feet AGL). 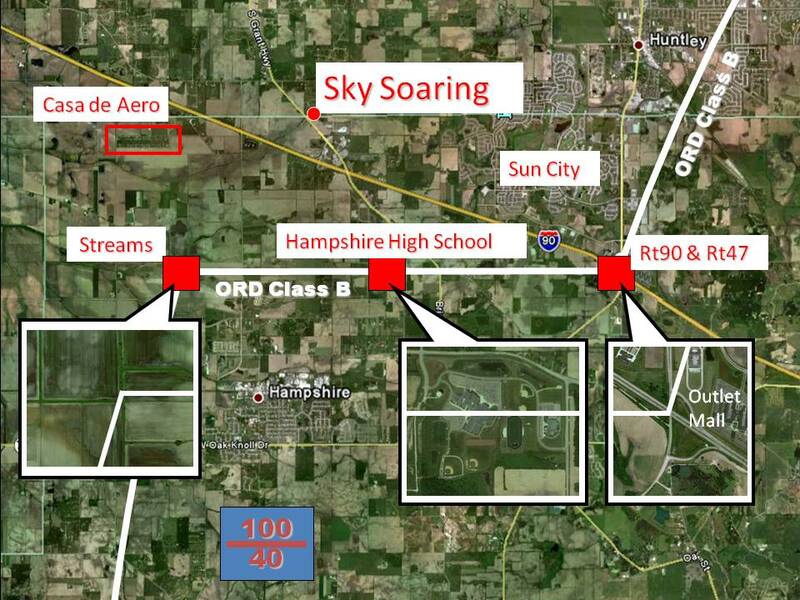 The north edge of this expansion is only 4 miles away from Sky Soaring. The western edge is only 10 miles away from Windy City Soaring Association. With a 4,000 foot floor to this airspace, soaring will be all but impossible within this important north-south corridor. Please take the time to fill out the FAA comment form and return it to the FAA at the address, or FAX number, shown on the form. Express your opposition to the expansion. Help the FAA understand the size of the affected soaring community. Help the CLGC and your club with your words. Feel free to use the sample comment form by simply adding your personal information and sending it into the FAA. The comment deadline is Monday, March 30, 2009. Thank you in advance for your help.